I was too nervous to write my own synopsis. I was afraid that I would crack under the pressure of not giving anything away and end up writing spoilers in all caps and shutting my computer off so I didn’t have to deal with the fall back. Celine Gonzalez is living the dream. She’s a beautiful and talented woman with an acceptance letter to a prestigious art institute and is a hard worker. So why did she kill herself? Celine's best friend, Maggie Sparkes, arrives in New York to pack up Celine's belongings when Maggie discovers a lock box with a scandalous photo and enough suspicious evidence to suspect that Celine may not have committed suicide, no matter how clearly the evidence shows she did. There was a man who Celine thought would change her life. 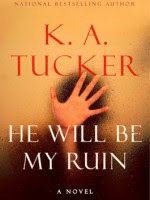 Until he became her ruin. But Maggie’s investigation inadvertently puts herself on the killer’s radar, and the killer will stop at nothing to keep his crimes undiscovered. This one was a serious page turner and I haven’t felt so mentally involved in a storyline for awhile. Great characters, excellent complexity in the story, and unexpected red herring, lots of suspense, and a messed up killer. I texted @ursula_uriarte though the entire thing. Special thanks to her for talking me out of reading the end first just so I could read the thing without losing my mind. In the end, it was fun to lose my mind with suspense and made the ending so much better. I have read a couple K.A. Tucker books and she's an excellent writer. I know that whatever she writes will be good.